There are numerous types of advanced welding, all of which require training, practice, learned techniques, and knowledge. Some advanced techniques have been used for centuries, such as glass welding, and some advanced welding techniques have only gained popularity in the past several decades, such as laser beam welding, which found its footing with the creation of mass automotive production. Laser beam and glass welding are two examples of advanced welding techniques that require a great measure of skill, patience, and practice. Both are also considered specialized areas of welding, and require advanced welding training and/or practice – typically in addition to a fundamental professional welding education. Laser Beam Welding (LBW) is the process of welding metal together using laser beams. The concentrated point of the laser makes for higher heats, which means tighter, thinner, deeper lines, and faster weld production. Small beams also means small heat affected zones (the focal spot), which is ideal for smaller workspaces, or large companies with lots of employees that specialize in mass production. LBW is extremely versatile, and can be used with carbon steels, titanium, aluminum, and stainless steel. Due to high cooling rates, cracking can be a concern when welding high-carbon steels. Yet, LBW has numerous advantages, including no generation of dangerous x-rays, transmission through air instead of vacuum, easy application with robotic machinery, and generally higher quality welds. There are different types of lasers used for this technique, such as solid state, gas, and fiber lasers. Laser beam welders work in automobile factories, with computer manufacturers, and in the medical settings to create medical machinery. Glass welding is used in a variety of ways, and is commonly used during glassblowing. Glass welding is used to make scientific equipment, lighting, neon signs, glassware, decorative glass (such as pottery, sculptures, and bottles), and flashtubes, among other things. 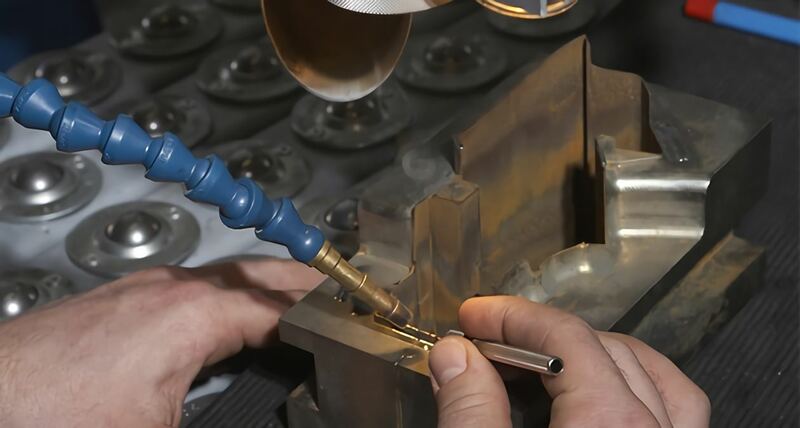 Many companies still use individual welders to craft their molds, oversee their product production, and act as consultants for manufacturing. Glass does not have a specific melting point, but a range of melting points (all relatively high), depending on what type of glass it is, how thin or viscous you want it, or what you are bonding it to. Because glass requires so much “guess work” as to when it is ready to shape or meld, welders must have in-depth knowledge of the properties of glass and vast experience with the behavior of various glass types under heat. Glass is welded with either a gas torch, and oxy-gas torch, or a furnace, and turns into a thick viscous fluid that is easily formable when heated completely. Tubes can be inserted into melted glass, so that it can be “blown” into different shapes and sizes. Glass is especially sensitive to heating a cooling, and can easily crack or fracture if not properly attended to. The process of slowly and evenly cooling glass is called annealing, and takes a considerably longer time that metal cooling. However, certain types of glass simply will not weld together, not matter how hard you try. Welding is a highly versatile business, and there are numerous types of welding that can be used in a variety of ways. Many view welding as a pin-holed industry, dominated by only a few types of generic welding techniques. Yet, welding is a dynamic field that is only growing in popularity, especially with the continued growth of automobile, construction and electronics industry. Choosing a career in welding means an opportunity for various exciting and evolving options. There are many more types of advanced welding than the ones listed above, but for educational purposes, both glass welding and laser beam welding are exciting examples of where a career in welding could lead you.